Tiny Tim is all grown up, and everything he loves and holds dear has been ripped from him. 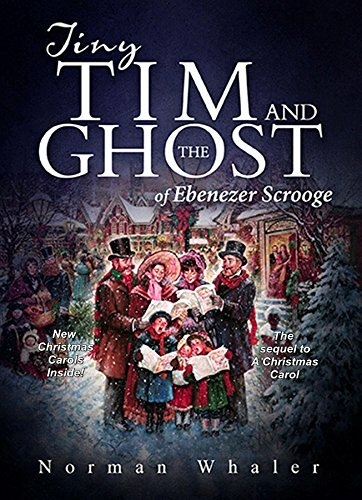 Upon the death of his dear friend, Ebenezer Scrooge, Tiny Tim begins to question each of his beliefs and the very faith that had been instilled in his family with the love of Scrooge himself years ago. Tim, now an adult, is faced with the loss of another of his dear loves, Becky. As fate would have it, Becky is simultaneously suffering through the most trying time of her young life on the streets with her young son and no place to lay their heads. Just as fate intervened fourteen years ago in the form of Ebenezer Scrooge, fate lays its hand on upon Tim once more. Norman Whaler has crafted a beautiful tale of faith, hope, and love in his sequel to Charles Dickens’s A Christmas Carol. 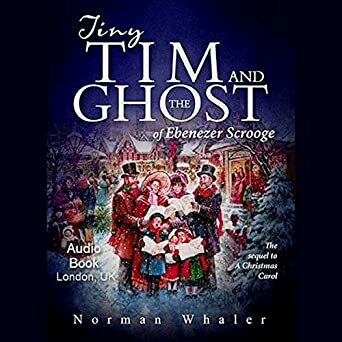 Tiny Tim and the Ghost of Ebenezer Scrooge – Audiobook details the events surrounding and immediately following the death of an aged Ebenezer Scrooge. Tim Cratchit, once the young crippled boy benefiting from Scrooge’s change of heart in A Christmas Carol, is impacted most of all by Scrooge’s death. From beginning to end, Whaler’s sequel to the beloved classic pays homage to the original plot and the beautiful transformation made by its key character, Ebenezer Scrooge. Though Tiny Tim, now all grown up, is the title character, he also exhibits a change of heart similar to that of Scrooge. Tim fights a battle within himself as he struggles to regain his faith. Whaler does a phenomenal job of adhering to the feel of the original book with his references to Scrooge’s character transformation. The reader watches as Tim fights a similar battle and, ultimately, wins with Scrooge’s help. As a fan of the original tale of Scrooge and the Cratchits, I could not help but fall in love with the parallel story line and the magic of three as it again reared its head in Tim’s life. The sound quality and voice over is exceptional in this audiobook and delivers this lovely story in a clear and crisp manner. Scrooge’s reappearance from the afterlife is expected but quite fitting. Whaler has done Dickens proud with this quick read rich with character development and steeped with faith. It takes a bold artist to follow up a masterpiece. Far too often, the original creators can’t even recapture a work’s magic in its sequel. Sometimes though, the most devoted admirers are up to the task. Norman Whaler’s Tiny Tim and the Ghost of Ebenezer Scrooge – The Sequel to A Christmas Carol might be derivative, but it’s derivative in all the right ways. Whaler knows he’s trying to extend Dickens classic, and he succeeds. Whaler opens his sequel by briefly summarizing the ending of A Christmas Carol – which quickly helps ground any readers who haven’t read it recently. Here, we see right away that Whaler makes the smart decision to evoke Dickens rather than imitate him. He echos Dickens’ source of tension in the characters’ lives: for crippling poverty still grips this corner of London. And with the newly philanthropic Ebenezer Scrooge now deceased, the citizens again find themselves facing an English winter without money for food or clothing. My favorite part of the reading was hearing more from the side characters whose voices drive the plot. Unfortunately, the illustrations that start each chapter vary wildly in terms of style and medium. They all match the subject of the story well, but fail to match each other. Some appear hand drawn while others have been made on a computer. Even just applying the same filter to each illustration would have helped unify the novel. Whaler clearly admires and respects Dickens, but I do think he missed out on an opportunity to be a little more self referential with the sequel – Dickens might very well have appreciated just such humor. Regardless, the voice and tone that first made this Christmas classic are there in full force. If you read the conclusion of Dickens’ original to your children while a cold winter blast beasts against the frame of the house, they might just turn up toward you and ask, as so many readers have over the decades, “what happens next?” In such an event, you now know where to turn.